I just stepped out of a meeting, and I wanted to talk to you about something that surfaced in the meeting I just stepped out of. Someone was asking me, “Ryan, how do you multitask so well?” They were assuming that because I have so much going on, I've learned how to master the skill of multitasking. Here's the reality, my friend: you can't multitask. Multitasking is a lie. You can say it is a bunch of baloney; it doesn't work. People say, “I'm a great multitasker,” and the truth is you are being deceived. You are not a great multitasker because your brain was created to focus on one thing at a time. Did you know the word multitasking was not even created until 1966? It was created by IBM to talk about how computers can do more than one thing at a time. The truth is, you can’t multitask. If you think you're multitasking, all you are doing is switching from one task to the next task to the next task to the next task: back and back and back and forth and back. The truth is when you multitask, you really lose effectiveness. Let me give you a little hint here (as a guy that tries to balance about 65 balls in the air at a time), and that is your best bet is to focus on one thing for a period of time, then focus on something else for another period of time, and something else for another period of time. The whole idea of multitasking and trying to do five things at one time just doesn't work. At the end of the day, you are not nearly as effective. Friend, here's my task for you today: there's a frog I want you to eat. Are you ready? Mark Twain said that if you eat a live frog first thing every morning, nothing worse is going to happen to you the rest of the day. What he meant by that and what I mean by that when I teach is this; that sometimes you need to do the most difficult thing first, like eating a live frog, and everything else is going to go better. What I want you to do is I want you to identify a few big items on your to-do list. I bet if I looked at your to-do list that you could probably show me 6, 8 or 10 things that have been on there for over a month, maybe more. What you need to do is, you just need to devote some time and start making some progress. Then you need to devote some more time to something else, so you can start making more progress. 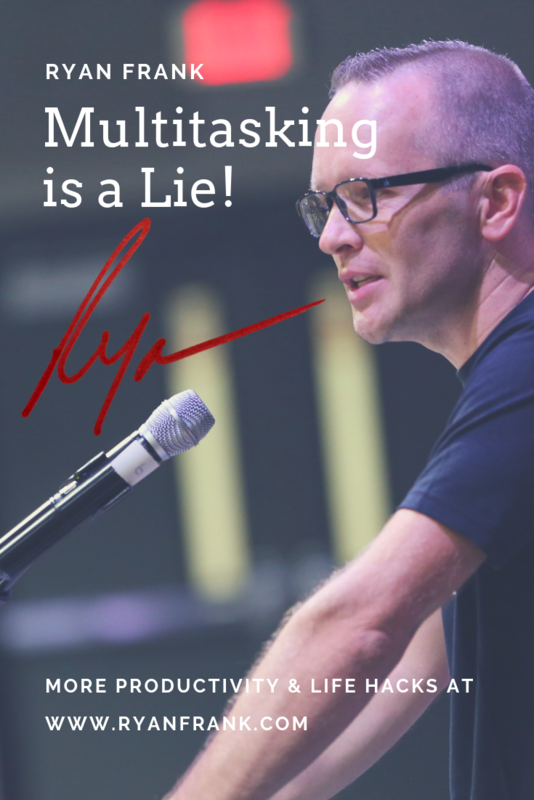 Don't believe the lie that you can multitask; all you can do is switch between tasks. What you are going to be better off doing is listening to my advice and focusing on one task at a time. Because here's the thing, I don't want you to be busy. I want you to be productive. There is a big, big difference. To be productive, you've got to have allotments of time where you focus on certain things, and you get them done. Ready to start? Go start. Are You Firmly Planted on the Rock?